2016 Leaf Ultimate Draft Football offers an annual look at the top NFL Draft prospects. While previous editions utilized a consistent look, 2016 incorporates earlier Leaf Baseball designs. Each box includes five autographs. Mainly showcasing the top names heading into the 2016 NFL Draft, Tom Brady is also included in the all-autograph release. The Base Autographs feature the 1990 Leaf design and are joined by Leaf Gold Rookie Autographs (1991 Leaf Rookie Insert) and Leaf Black Gold Autograph (1992 Leaf Black Gold Insert). All autograph designs feature multiple limited parallels with print runs as low as 1/1. In addition to Tom Brady autographs, signers include Hesiman winner Derrick Henry (RB - Alabama), Cardale Jones (QB - Ohio State), Ezekiel Elliott (RB - Ohio State), Payton Lynch (QB - Memphis), LaQuon Treadwell (WR - Ole Miss), Jared Goff (QB - California), Carson Wentz (QB - North Dakota State), Braxton Miller (QB/WR - Ohio State), Christian Hackenberg (QB - Penn State) and Connor Cook (QB - Michigan State), among others. Leaf Ultimate Football is a limited release with less than 300 total cases produced. Christian Hackenberg. 2016 Leaf Ultimate Draft Gold Rookies, AUTOGRAPH!! All subjects do not have Purple parallels. Leaf just knows how to do it. Love that they clearly tell you which players are redemptions. And the price point is in real world stratosphere. 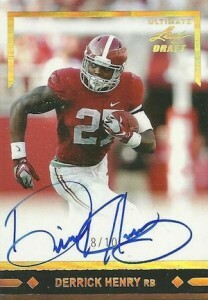 If it was Topps and Panini I can only assume a product with 5 autos including Brady would cost more in the $250 range. Thank the cardboard gods for LEAF. 2015 Leaf Ultimate Draft Football Box - 5 Autos!! !